How Cold War! This was promised to be delivered by today. Perhaps it has been put in the mail? If the popular media asks no questions about this, then we know where we stand in Ontario. Well, it's race: Sunshine List or Bruce Papers. As they probably both will be released at one minute to midnight, I won't be up to see them. The first thing is that somebody should put that list on a spreadsheet, and filter out everything under $200K. With overtime, anybody and their dog can earn that! As well, there are countless arbitration back-pay settlements. I remember when this list was used to kill a very fine OPG VP, who went off to the States to earn real money. The Bruce Wikileaks (Papers :) will be fun, but I don't think I can read them. They will try their best to nail down the assertion that there is no geology in the Precambrian basement, that it is all solid rock, ground flat. Such a heart-breaker! ps. to my followers, check out my new Knol sci-fi. Don't tell anybody. There’s considerable irony in the NRU saga, according to the Society of Professional Engineers and Associates. The entire Maple project was hatched, union vice-president Michael Ivanco says, to settle a lawsuit stemming from the previous Tory government’s sale of part of AECL’s isotope business in the early 1990s. That privatization, of a division called Nordion, netted $165 million. The failed Maple endeavour has cost far more, with the final price tag still to come because Nordion is suing Ottawa for $1.6 billion. As you know, I don't really go with the Union View, but no comment. The operators of the San Onofre nuclear power plant are proposing a multimillion-dollar study that would use new technology to better assess seismic conditions near the complex. Edison officials said the proposed study would tap into new technology that could lead to a more accurate threat assessment. San Onofre was made to withstand a magnitude 7 quake from a fault five miles away and is protected by a 30-foot seawall, Alexander said. That darn US, it's not ready for an earthquake. As for the rest of the country, "I'd say we're pretty much unprepared," said Hamilton. The New Madrid fault, which runs through the central Mississippi Valley, poses a major worry for seismologists. It was the site of major earthquake activity in 1811 and 1812. 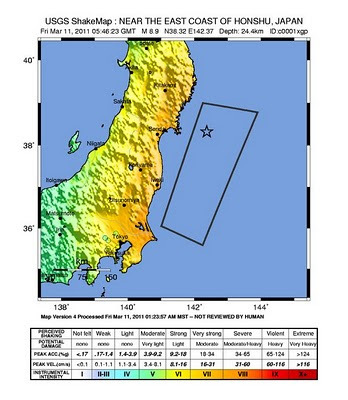 "The New Madrid earthquakes, if those were to reoccur, that would be a disaster on the scale of what happened in Japan. Very little has been done to prepare for the occurrence of that event." And what if a large quake were to occur on the densely populated East Coast? "Structures just aren't designed to handle earthquakes," Hamilton said. Earthquake preparedness gets "worse the further east you go." Good thing we aren't down there with all those earthquakes. Nothing major to write about. -Arkansas continues to have minor earthquake activity. When are they going to start the pumping again, since they can't even wheedle out a pumping chart. -big day tomorrow! The sunshine list as well as the Bruce Papers. -I like to watch the Darlington hearings for at least 10 seconds. Longer than that, and I start to rip out my hair! A tremor has been recorded near the Atomic Energy Canada Ltd. nuclear laboratories in Chalk River, Ont. Earthquakes Canada reported the 3.5-magnitude quake happened about 70 km northeast of Chalk River, around 12:04 p.m. Tuesday. So, to add to the nuclear panic, it seems we have gone to Stage 2 of my meltdown sequence. Stage 3 is the 'China Syndrome' where the fuel becomes critical again. I didn't think S2 was possible, and I don't know about S3, since it was only the control rods that stop the fission. Hopefully, some of that stuff melted along with the fuel. So, I've added the little red blobs. The good news is that we might have low-density stringers as the slag falls through the seawater. The bad news: I don't know what sort of party these things might have at the bottom. That water will become very hot with radioactivity, and will have to be dumped into the sea. The current plan doesn’t address the fact that the site is next door to a gravel quarry. Blasting shakes the ground, and quarrying can lower the water table underground, causing land in the surrounding area to become unstable and sink. I suppose they are going to wait until the afternoon of the 31st. This is when the Bruce Waste Thing documents are released. I must admit they are very brave to dump this right in the middle of the Darlington hearings, and our general nuclear panic. The Darlington motto is: "We shall ignore all regional geology. ", but then they proceed to do nothing geological at all. In an effort to pacify its critics, TEPCO held a simulated earthquake drill in January at Kashiwazaki-Kariwa, the first time it had done so at any of its plants. But while TEPCO said the plant passed the test, which was based on a 7.0 tremor, it did little to mollify local residents. Yes, these efforts to pacify tend not to work when it's all opaque. That's what I've been saying all these years, that things need to open up a little. Although all these people are wonderful (and I won't use the s-word), I have never found anybody who looks beyond the end of their nose. Thus, they will look at all the seismicity statistics for things that happened right at the plant, they will never look at the geology down the road, or deep underneath them. This is cute. Puts things into perspective. During the crisis, I wasn't quite sure about these reactors, or the stages of meltdown. I've learned a bit. First of all, you can't get a handle on how huge and high these things are. They are the worst design ever for seismic, which wants to keep things low. I learned that zirconium burns as well as melts. Whoda thunk? The happy state now is that everything is flooded with seawater. But they have these ridiculous high spent fuel pools. Unit 4 had all it's hot fuel out in the pool for maintenance. I think it was boiling even before the earthquake. How stable was that? It looks like everything was working before the tsunami. They had a wall for a 6 m tsunami, but not the 10m that happened. A tsunami is a big slosh of water, not a wave. Even if they raised a 10 m wall, I wonder if the water would just jump it with the momentum. They have to work on this. ps. that big concrete bottle can't hold all that radioactive water. It is now seeping through concrete cracks to show up anywhere in the plant. Shades of a video game! 3. Why did the Geological Survey of Canada avoid questions about possible geological weaknesses near Darlington? Mattson asked Lamontagne about a 1993 study suggesting there are geological “lineaments” beneath the site. A lineament is not necessarily a fault line, but it may be an indicator. OPG did indeed give a detailed presentation discounting the risk of geological weakness in the reactor zone. But it is, after all, the project proponent. Why the silence from the disinterested federal experts? Why not? Since our megathrusts dip ever so gentle all the way to the bottom of the crust, there is a big fault under everywhere in S.Ont. I'm surprised nobody reminds OPG about the CSA requirements for new nuclear, which I can't quote here, because they are top secret. Really, there is an obligation to do a bit more than, let's say..... nothing! I'm not writing anymore, since I realized there was a tv show that told you everything you need to know about global tectonics. I like the part about Southern Ontario. Southern Ontario on the other hand, occupies a so-called 'intraplate' setting, a safe place it was then thought when our nuclear plants were built decades ago in the absence of any fundamental knowledge of the faults that lie directly below Pickering or how Canada's geology had even been put together. Some geologists speculate that a large break (rift) in the crust lies below Lake Ontario connected to the dangerous St. Lawrence Rift which underlies the Ottawa Valley and St. Lawrence River extending as an arm down the Hudson valley to New York. Moderately large damaging earthquakes occurred in 1732 (Montreal; M5.8), in 1935 (Timiskaming; M6.2) and in 1944 (Cornwall, Ontario - Massena, New York; M5.6). The last was Canada's costliest with considerable impact on urban infrastructure. 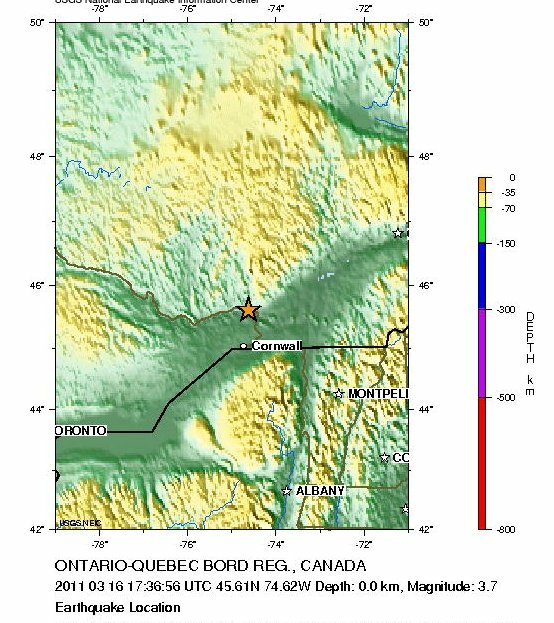 Large landslides in the Ottawa Valley and active faults below the floors of lakes in the northern reaches of the valley again indicate large prehistoric earthquakes. As geologic research moves forward, so the 'recurrence time' of such earthquakes steadily shrinks. A magnitude 7 earthquake every couple of thousand years is now suggested. But when was the last? Do we know the full population of faults below our towns and cities? 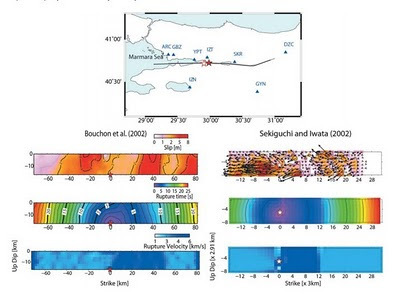 Do we know enough about how local rocks and sediments behave when shaken? Eyles was a chief proponent of the 'Fault Under Pickering' camp, which our drilling and deep geophysics tended to wipe out. That was the last research done in this area. I see he can't leave it alone, but I agree that it is almost criminal to consider new reactors without a speck of new work for geology. I wish he would show up at the Darlington hearings; and because he is so powerful with a tv series and all, I will say: "Yes, there is a big honking fault under Pickering (more or less)! Why am I sucked into these meaningless hearings? Still, there are entertaining tidbits. I'm following it on Google Reatime (Twitter), since all that webcast stuff doesn't work for Linux. Now, the latest is that they say there isn't enough room on the site for cooling. Heck, there isn't enough room on that site for anything! (I didn't say that). Of course, the greenies call them 'environmentally friendly' cooling towers. They are not for our climate. The ice fog would kill every bird, and everybody on the 401. Cold climates can live with lake discharge, since most of the warm water stays on top. You can't tell of any environmental damage from the other nuclear plants because of all the invasive species! The concept of 'damaging' the lake with slight heat is ridiculous. As I said we picked 30%, but you have to understand this was not the true label. 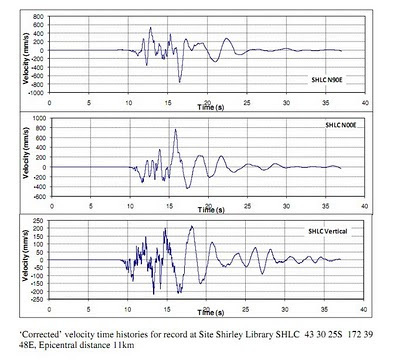 Seismic experience data came from the examination of hundreds of factories and steam plant exposed to earthquakes. None of these had instruments. So basically, they had to use the Shakemap conversion to the Modified Mercalli Scale. As you can see, 30%g falls right between Intensity 7&8 (forget the dang Roman Numerals!). The description is as follows. 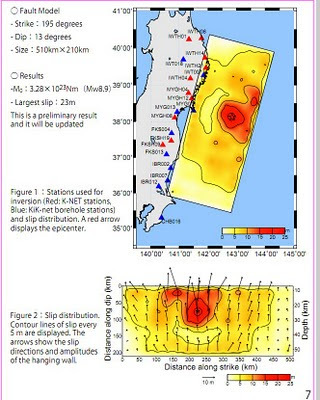 I would put this very close to the epicentre of the Chile earthquake at about a PGV of 30-60 cm/s. This is probably Christchurch2, where old brick buildings are shattered, but that is on poor ground. Cornwall 1944 hit I7 on the soft soil, but barely felt on the hard ground. 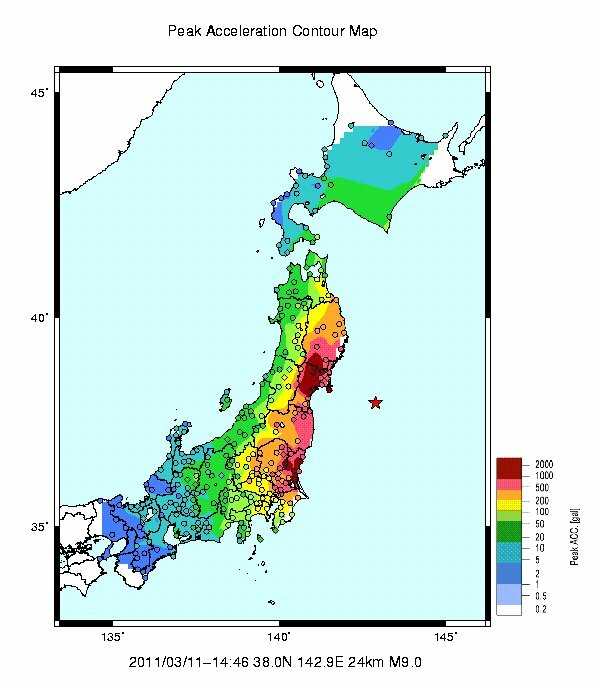 This is also close to the recent Japanese earthquake where PGV hit 10 to 100 cm/s depending on the ground. So, when they went to a steam plant, they looked around at the general damage and estimated the MMI. This was used to label the damage (or not) with a %g (for engineers). In reality, hard ground (rock) cannot physically exceed 10 cm/s (20 at the thrust of a supershear) because the rock cannot carry that stress. So, now I think the PickA review earthquake was overkill for the main plant on piles, but lacking for the soft ground. The repairs they did were so expensive, I only wished for a fraction to go to better science to cut down the PGV in the plant. At this point, I left the study. However, later, I was extensively trained in the method, and reviewed all the work done at PickA. The next part will be the actual walkdown, or stress test. For those who like something meaty with their morning Timmy's, you can read the transcript from page 36. They agree that the 1 in 500 earthquake is an M6 for Toronto. I put it at M6.5, but the uncertainties swallow all estimates. Because we expect these earthquakes to boom off at the same point every 500 years, like Japan, the more remote odds used in nuclear plant (1 in 10,000) pretty well give the same result. It really needed extensive modification for Canada and Candu stations. It is basically a process of assuming a test earthquake scenario, and then running through the whole plant looking for weaknesses. Looking at everything was impossible, so the list was narrowed down by choosing a couple of paths (operations) that would allow safe shutdown and cooling. All the systems on those paths would be looked at. This walkdown (examining the systems) would have picked out the Japanese generator problem in a flash! So the first job was to pick a decent earthquake that would stress test the system. It would be no good to pick the 'Earthquake From Hell', that would leave everything in dust, mainly because you would be able to improve anything. Besides that earthquake is up there with a large meteor strike. 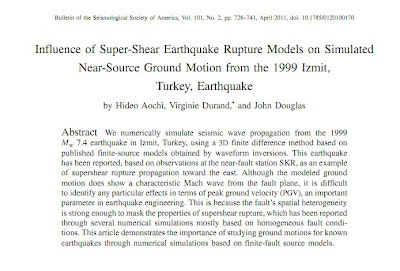 We chose the 1 in 10,000 earthquake, as derived from pure seismological studies. Unfortunately, the US could only think in terms of peak ground acceleration and this was a 30% g earthquake, which usually isn't enough to dust off the shelves. -more later, I have to bake cookies. As long as nobody reads this blog, I won't get into trouble with these extracts. They are getting absolutely ruthless with this now. 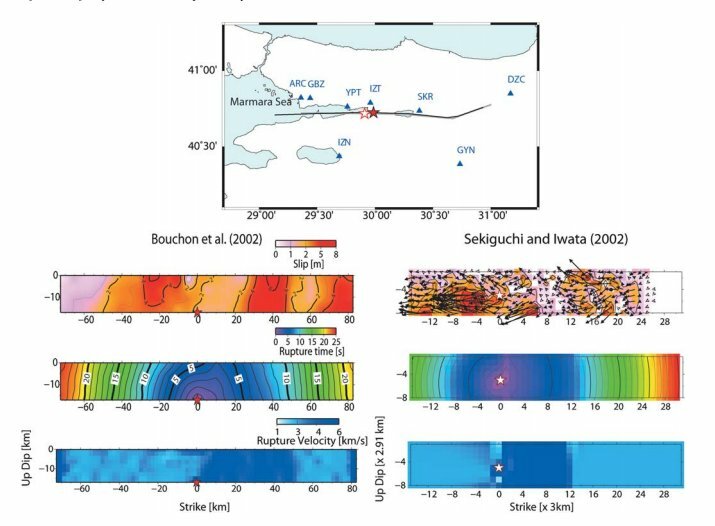 Anyway, this is a supershear strike-slip earthquake, which has a very small zone of high PGV's, and is not as interesting as a supershear thrust fault. And this is what it does. It produces firm-ground PGV's at over 1 m/s. When I'm pretty sure the glass-reactors were knocked out at 0.1 m/s, and Chile's cheap condos were knocked out at 0.7 m/s, you can imagine what 1.2 m/s can do! Multiply that by 10 for soft soil basins, and the dirt flies in the air! It's BSSA time again, and here's something. 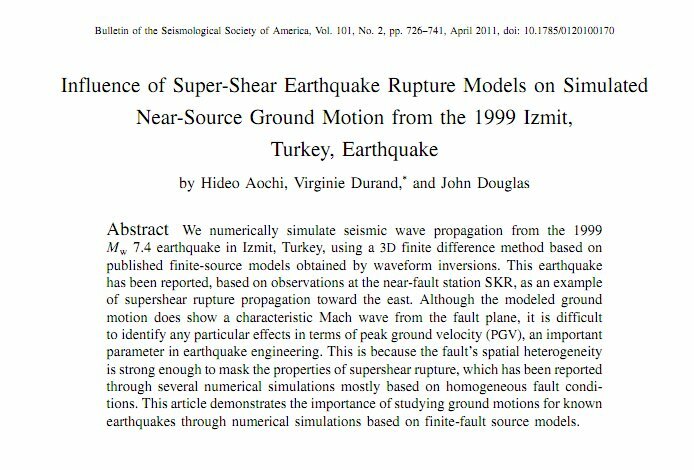 There is also a great one on supershear earthquakes, which I am still reading. So, we get this strong 1.7 Hz signal. All conventional noise studies usually stop at 30 Hz, which is about the lower limit for human ears. But the body feels much lower, and we know from rock concerts. 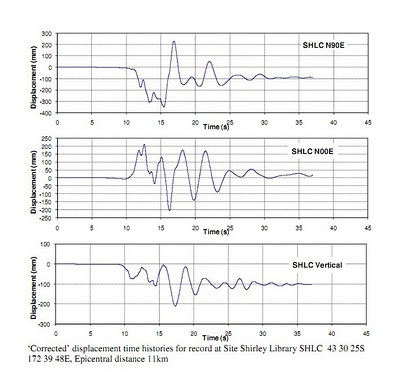 1.7 Hz would be a heart beat for some people, and it is detected for a long distance. Time to get an isolation room and expose people to this - see what happens! 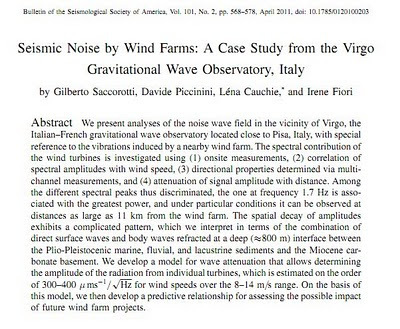 This is the first wind farm study that has measured infrasound. And it was a very small wind farm! Our seismic network in Ontario can measure this low. Anybody got some money for research? This is a new series to help me rise above the cat-calling and hissy fits of the current nuclear debate. There is no imminent threat to Hamilton or our nuclear plants. There, I am detached from the popular news. A brief overview of the contents, because I feel lazy today. -review of previous methodology, requirement to precisely define the remote earthquake at about 1 in 400 (snake-eyes with a pair of 20-sided dice). -modern seismic experiences -- when there is damage, and when their is no damage. -should this test extend to all surrounding facilities? GTA? -need for a program to resurrect old efforts to examine deep crustal geology. -currently, uncertainties overwhelm any conclusions. -what is the PGV for the rare earthquake? -where is most likely location? I'm not putting in more seismic monitoring, since I think we have the best in eastern North America. Give credit to OPG for bankrolling most of it. Nothing else in the quake-stricken area has come through anything like as well as the nuclear power stations, or with so little harm to the population. All other forms of infrastructure – transport, housing, industries – have failed the people in and around them comprehensively, leading to deaths most probably in the tens of thousands. Fires, explosions and tank/pipeline ruptures all across the region will have done incalculably more environmental damage, distributed hugely greater amounts of carcinogens than Fukushima Daiichi – which has so far emitted almost nothing but radioactive steam (which becomes non-radioactive within minutes of being generated). 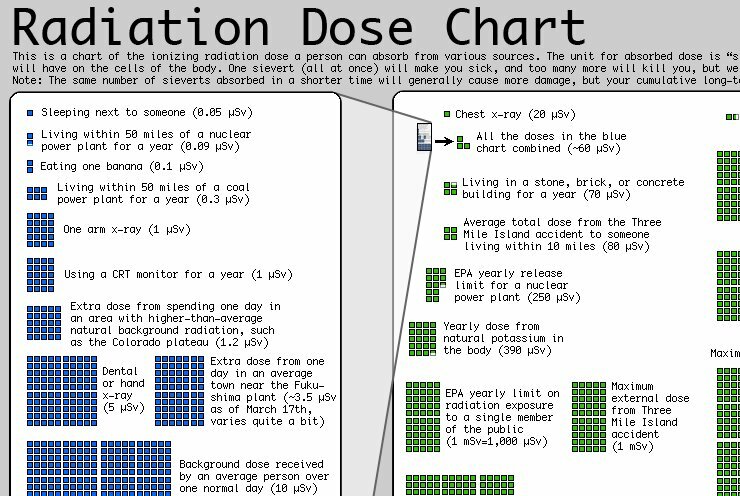 I like this article, but really, it encourages utter slackness on the part of the nuclear plants. Those lining up for the Darlington hearings (live tweets anyone? ), should always remember that life is a roll of the dice. For our earthquake, it is a roll each year of a pair of 20 sided dice. If it comes up Snake-eyes, then we get hit. And really, we only expect some radioactive steam, while you may be dead or homeless, or most likely freezing in the dark. 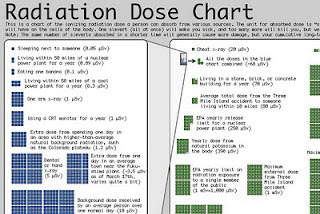 Will the radioactivity be the most important thing in your life? My main beef with nuclear incompetence is that we'll never get the power back on because the nuclear plants will be a mess, and not with the minor releases. But I still don't think we have the brains for new nuclear, so we will keep Glass-Pickering running for a long time. Just hope for a good roll! Get up early for the Darlington hearings! Lucille Jamault is with the Canadian Environmental Assessment Agency, which is running the hearings. 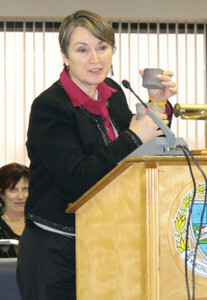 Jamault insists the process will allow all views on the project to be heard. “Everyone who will be there, their point of view will be taken into consideration,” she said. I surprised there aren't people camping overnight! This is better than a rock concert! It's being held in a tiny church basement, but I expect there may be some crowd control issues. So, enjoy yourselves! I hope you get a seat! After all, each and every one of you will be able to offer your opinion to the hearing. There are my hits. I'm going down, and I'm soooo glad! There was almost a threat that the big guys would have to pay attention to me and slap me down with their good Japanese methodologies. Now, the government has thrown out the 'standard fish' of having a review. That always makes everybody happy -- millions thrown around, the NGO's get money, the newspapers get exclusive access. Nobody is left out! Of course, if a speck of that were to be spent on science... Not to happen! Now that the panic is squelched by the promise of a lawyer review, I hope that newspaper guy abandons his article. Really, with no money spent in the last 20 years, and no prospect of any money, why would anybody speak out on earthquakes, other than to issue the standard platitudes that 'it seems like a nice quiet area'. Canada has five nuclear power plants in different states of operation. The Canadian Nuclear Safety Commission is asking for a review of all Canadian nuclear plants in light of the disaster in Japan. The in-depth review would also include Atomic Energy Canada Ltd.'s Chalk River Laboratories facility, located northwest of Ottawa. Ok, I have been approached by a local newspaper for a soundbite. No way! I get no money for this grief, and I have no smoking gun, since nobody does any scientific work on this. All the advantage goes to those who sit and do nothing. This is a reasonable article. Wish we had an organization like this in Canada. Nearly six years before an earthquake ravaged Japan’s Fukushima Daiichi nuclear power plant, U.S. regulators came to a sobering realization: seismic risks to nuclear plants in the eastern two-thirds of the country were greater than had been suspected, and engineers might have to rethink reactor designs. New nuclear reactors just aren't economical, says the CEO of the largest nuclear operator in the United States. Exelon's CEO John Rowe says that the economics of cheap gas makes a nuclear renaissance unforeseeable for the next few years – and had done so before the quake prompted regulators to politicians to review their policies. 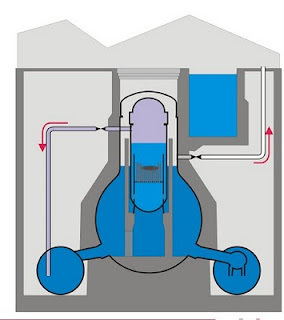 "At the present time, new reactors are not economical anyway. Natural gas-fired generation is now the economic way to produce low carbon electricity, and that will be true for about a decade," said Rowe in an interview with Bloomberg. 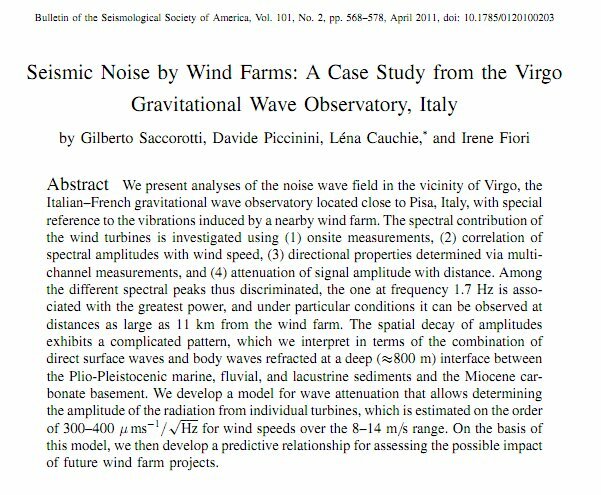 I've been all for nuclear, as the only people who have money to do decent seismic studies. But in the seismic biz, like the Quantum Cat, there are only two states: Willful Ignorance or Total Panic. Right now we'll get statements from the engineer union, or the nukes, trying to quell TP. When this is over, they will use those statements to promote WI. Nobody is saying anything useful, like : "We realize there are major unknowns, and will spend gobs of money resolving them." The engineer union has only concerned itself with wages, and never the state of the craft. Now, the shale gas industry spends no money on seismic. They willy-nilly start earthquake zones and nobody does anything. So, they will take over power production. But the biggest cause of Nuke-extinction is the total absence of any designer intelligence in the industry. They are all Soviet operators, putting production over all else. They stick to their age-old safety bibles that were written 30 years ago. They stack up huge problems for the future. These people have totally withdrawn from the public. Can they actually build a new nuclear plant economically? No. Would any of them come out and say they can? No. Only the highly paid and trained talking heads. And so, my most depressing thing is to put the flowers on new nuclear, and give up hope for any new money on seismic. So boring.....I'm off to the psychiatrist. And so do dams! They all love being near deep water, and what is the cause of that? Yep, faults. The plant's design includes piping with shock absorbers intended to prevent breakage in a quake. "Before the plants are even built, there's research done by seismologists and geologists to determine what the maximum earthquake could be," Schneider said. "The plants are designed beyond that." So much wonderful garbage! Those 'hydraulic' piping restraints have been shown to be worse than useless, and most plants have removed them. Anyway, I have moved beyond the mere definition of a fault, so that my union geologist friends can't file a grievance for crossing their defined boundaries. I just do fault mechanisms, which are much more complex and require a geophysicist to define. :) I just hope all this controversy causes some changes. I notice that Food Safety people are touting more transparency, it's time for the nuclear gloomies to do the same! I hope everyone realizes that I am not defending the Universal Opaque Nuclear Management, but hope for a change. I find that the nuclear operations people are the same everywhere, and if that has led to disaster in Japan, where else? Yeah! We have our own earthquake! There's a fantastic earthquake mechanism around Cornwall, that brought us the 1944 Cornwall earthquake. But the seismic monitoring hasn't been up to the standard to resolve it. I wonder what NW trending basement structure is responsible. Maybe it's just something parallel to the Champlain rift of the Ottawa-area failed rift. Now, this is the good technical stuff, which is all I'm sticking to right now. That other stuff is way too depressing, and we all know I don't handle 'depressing' very well. 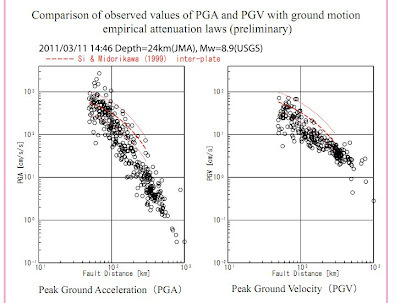 This shows the huge, factor of 10, difference in the PGV at the same distance from the fault. Usually, when you see this, you must assume the lower is on firm ground, and the upper is on swamp. We didn't have this sort of variation with Chile. I now make the big assumption that the nuclear plants were knocked out with a very low value of 10 cm/s to the reactor base, and the generators (which are always on swamp) were knocked out by 100cm/s. I don't go with the thought that everything was perfectly ok before the tsunami hit. 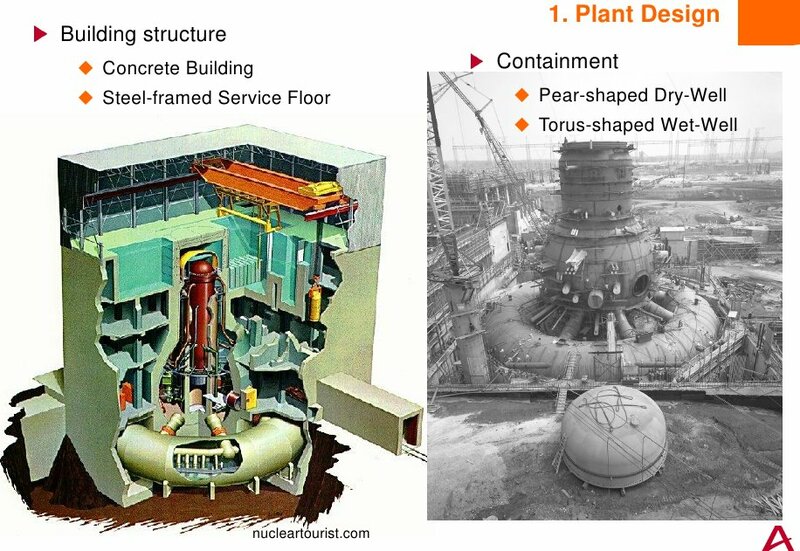 This makes Japanese reactors more fragile than condo towers! Now that we have the strong ground motion, we can have fun looking at the rupture dynamics. This was a very clean rupture, with a little blip on the side. Most magnificent! And on to something completely different -- who would have thought you could bring a piece of rock core to 'Show and Tell'? The fact you can bring it in little pieces might tell you something. When we were coring in good rock, you had 10 foot solid cores. Now, that would be something to bring in! Yeah, well that's old news. The St. Lawrence River valley is part of a failed rift system. That makes the whole place one big fault line. 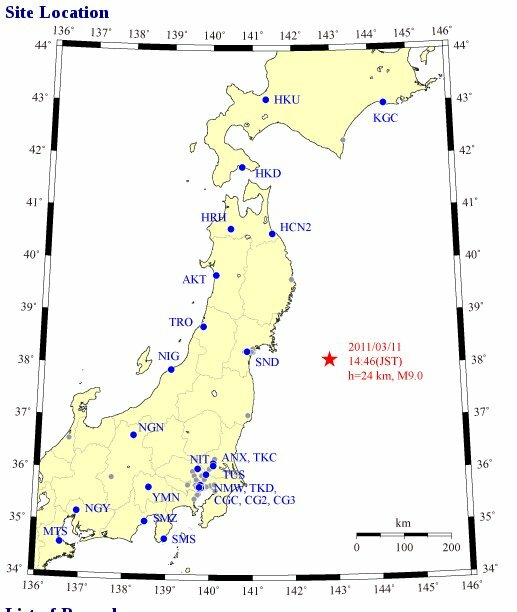 But active fault mechanisms are scattered along the system, and I don't think that the reactor location is worse than any other. Still, it reminds me of how hopeless those guys are for seismic. They never had any seismic expertise, and relied totally on the Federal Gov't experts, who usually had other things to do. I have no idea of their foundation conditions, and for my whole career, we never talked. People also forget that the type of earthquake required to significantly bother these plants is the type that will bring your house down on you. Even in Japan, how will the radiation compare to over 10,000 dead, and ten times that amount under severe life-shortening conditions. If you want to panic, panic about that wobbly chimney over your head! ps. I'll bet a dime to a hole in a donut that the Bruce Thing documents are delayed past the deadline. Well, I was wrong when I thought the slag couldn't get through the thick steel vault. It has cracked, which is almost the same thing. As well, I underestimated their ability to jam spent fuel so tightly into the swimming pools, that they can start the fission reaction again. One of the problems with a light water reactor is that the light water is such a severe moderator of neutrons. Thus, the fuel has to be of a higher grade, and more tightly packed than Candu. This gives space efficiencies, and the new ACR1000 uses more light water. 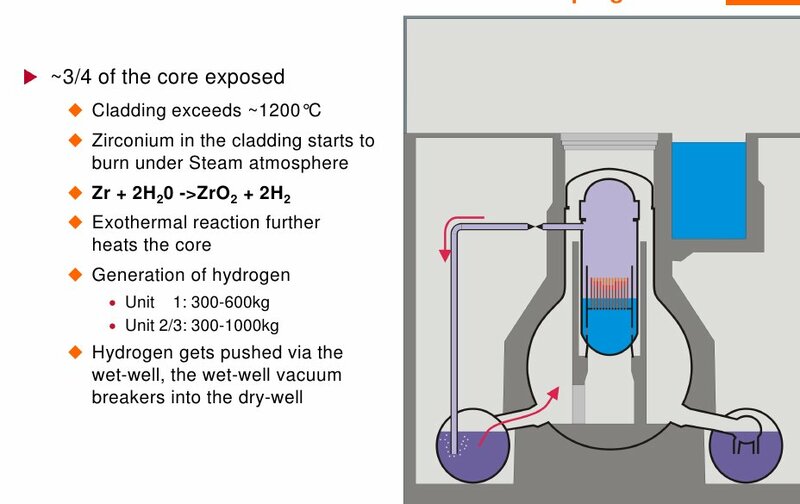 Whereas if we replaced the heavy water in Candu with light water (as in an emergency core injection), the reaction would be totally shut down. When they inject seawater, it makes no difference, and that is why they are using Boron, but they can't inject the required huge amounts of water and keep up the Boron levels. 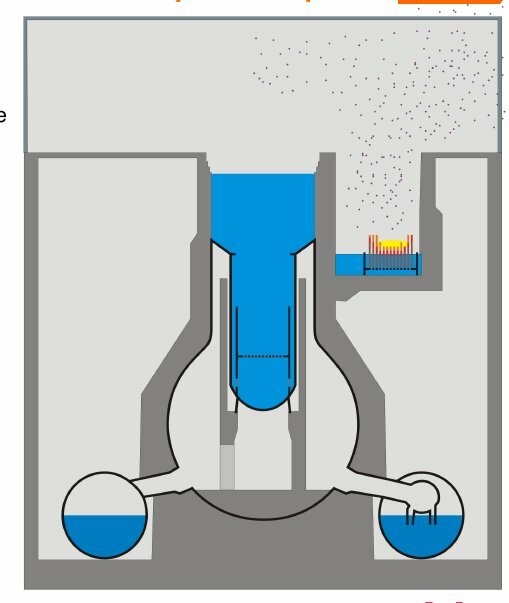 We actually use light water in columns to control and shut down the reaction during normal operation. There are the control rods for emergencies. Don't panic about the existing Candu reactors. Even with my best imagination, they can't reach this stage of meltdown, there is just too much water in the reactors. When we had experts in the old company, I think we could have reached out and stopped the panic. Now, people don't believe platitudes, or government toadies, and we have what we have. I always said this was the consequence of going totally Stalinist-Soviet management in the nuclear industry. More sensors, I thought the other map had too few. Must be multiple organizations. Although the other one showed only 30%g on the coast, this has up to 2g in some basins, and the coast is generally running at 1g. Shows the power of soft ground amplification, and I always wish for PGV's. BRUSSELS — The European Union reached agreement Tuesday to conduct "stress tests" on the continent's nuclear power plants, the bloc's energy chief Guenther Oettinger said. Oettinger said the tests would be conducted on a "voluntary" basis. He said they would look at whether the 153 reactors housed in half as many plants across the continent could resist earthquakes, tsunamis and terrorist attacks. "We want to look at the risk and safety issues in the light of events in Japan," he said. Oh, I could so get into that! I could be paid for making their lives miserable! Well, the Japan issue is settling down, and the nuclear slag has cooled to the point where it can't get through the heavy steel. My moment of fame is coming to an end, as my blog hits taper down. Still, there is fun in Canada! According to David Mosey, a nuclear safety analysts who has worked in the industry for 30 years, a risk assessment would take into consideration the most severe earthquake that could occur within a 100-year period at a nuclear site. He couldn't name specific lessons that would be learned from Japan's. "When we know more precisely what happened at Fukushima, then we could say this would prompt us to re-examine something. Information right now is sparse and the people who have answers are rather busy at the moment," he said. The CNSC did not provide comment on its review. This thing about 'risk assessments' reminds me of a story. 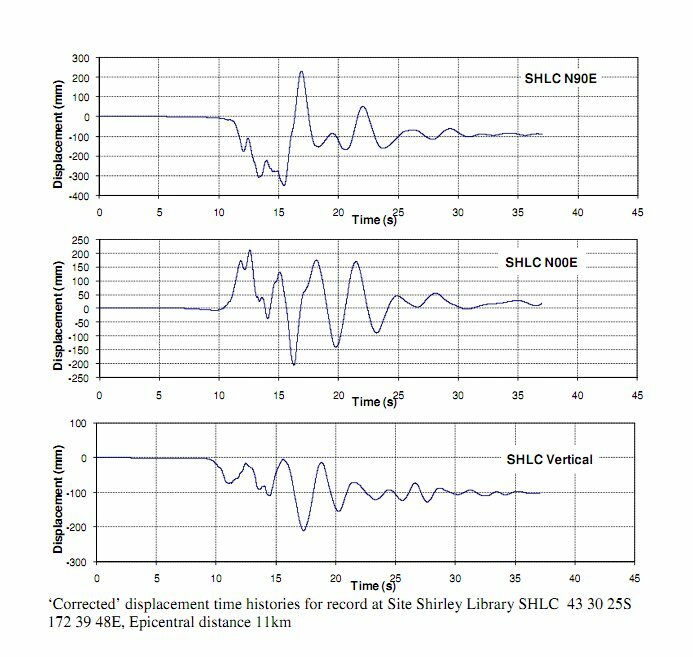 Did you know that in Candu risk philosophy they never considered LOCA (loss of cooling accident) with seismic? That's because they made up this ridiculous 'guillotine break' of a large pipe, which happens spontaneously out of the air, and didn't want to deal with seismic. The fact that the most imaginative engineer (me!) could never visualize this (alien attack? ), never slowed them down. I always thought the most likely cause of a smaller loca would be seismic. That's why I could never talk to the nuclear safety boys -- seismic was nothing to them. In fact, the last big 'risk assessment' totally excluded seismic. I made some good comments about that! In fact, nobody with Candu has ever gone through a realistic earthquake scenario, and I'm sure the Japanese never did it either. I'm sure it's the same in the US. Once again, like Japan, I suspect they are afraid. "There's nothing about Lake Huron that looks like the Pacific Ocean, there's nothing about the geology on Lake Huron that looks like the ring of fire around Japan and there's nothing about the Candu design that look anything like" the type of reactors used in Japan, he said. OPG's boss also wrote a very nice letter showing a human side. Although these guys never write their own stuff, I'm sure the speechwriters might read my blog. :) I'm waiting for the "We are human." note from the CNSC! Germany is going a bit far, closing their old plants, which I am sure are a million times better than Pickering! Interesting that spent fuel swimming pools are boiling in Japan. This can be easily solved by throwing in a firehose with seawater. Since they are throwing seawater all over the place, the whole plant will be destroyed by corrosion, but I don't think anybody would want to start it up again. What is the aftermath of all this? The fault rupture will now have its 500 year 'stress shadow'. 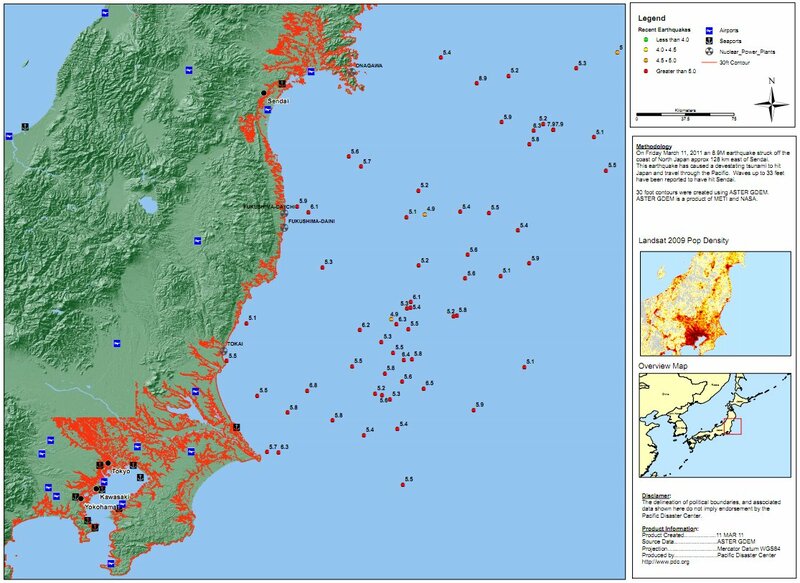 There will be no chance of the lightning striking twice here, but I wonder if they will go overboard and throw in a lot of tsunami protection along that coast. But the bigger issue is everywhere else in Japan! I think the lack of power will kill more people in Japan than the actual nuclear disaster, or tsunami, due to obvious effects (hospitals), but the more insidious effect of increasing poverty (lowering the standard of living). That's what I was always worried about for the Toronto Earthquake Scenario. It is the economic devastation caused by the inadequate seismic performance of the nuclear plants. The earthquake may slag some reactors, but they all may never start again for a long time. This is cute. It just shows that the little sparkling of foreshocks could have meant anything, and the M7 and M9 were right on top of each other. OMG! Toronto Emergency Management Even Woke Up! The crisis in Japan has prompted the City of Toronto's Emergency Managment team to issue a reminder to Torontonians, encouraging residents to take steps to be prepared for any emergency situation. Time lapse of aftershocks. The rupture length is smaller than the entire plate edge. Interesting, could've had an M9.2, not that it would have made any difference. Wow! No damn sensors. Motions at Sendai only 30% g, and I think PGV only 20cm/s, but who knows? Higher motions on the Tokyo basin. Well, it's going to be fun to sit back and watch the sound-bites flash by. We were only getting back into nuclear because of the horrid alternatives. How much power does it take to manufacture and maintain fancy solar cells, and wind things? Do they ever make it back in gloomy and windless Ontario? But still, all nuclear plants botch up the seismic thing. The Japanese hid behind their nuclear secret curtain, simply because they did not want it know that their reactors are as fragile as glass. They never let anybody know anything with regard to seismic, and hid all their horrible experience. Now, everybody and their dog is trying to localize this for the local news stations. There are a million 'Will it happen here?" stories, and nuclear plans are being shelved everywhere. What is fundamentally wrong with the nuclear industry? They feel besieged, and put up a glum silent face. The only people allowed to talk are the trained talking heads. At least in the old days we used to put up experts, but there aren't any left. In these days of iPad2's, does anybody go for these Soviet methods? No, and that's why they drive out all intelligence. There are only the janitors in charge, and they don't do seismic. 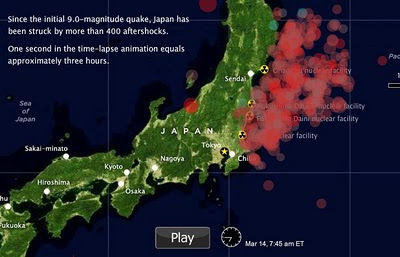 So, with our 1 in 500 year earthquake, we will be in the same situation as Japan. Hell, they almost slagged the reactors with the recent Great Blackout. The reactors will be injecting lake water into the calandrias, using firetruck pumpers, and they will be fighting hydrogen explosions, and radioactive steam releases. This will be because of Japanese-type sloppiness. Still, no panic people! The steam only has the volatiles. The hard stuff stays as molten slag in the reactors. There is no nuclear explosion. At the end you won't be able to tell the health impact over the effect of obesity trends. Just like we could never tell the impact of being showered by plutonium with the 50's nuclear tests, because of smoking. When the janitors took over the old company, everything was built according to the School of Too Cheap to Live". The Niagara Tunnel started like that. That means 'everything-else' that was not the heavy stuff, which was 'seismically qualified'. In fact, they spent billions on unnecessary 'seismic design', since nothing could touch this stuff anyway, but they left the back flap of their drawers open. This is shown by the horrid foundation conditions of the back-up generators, and block walls everywhere. The worst thing for the Japanese now is that they have no power. Are they going to let the glass reactors operate for the next section that is sure to rupture? Very interesting. The Pickering plant is believed to sit on a geological fault line. But officials at the province's publicly-owned utility say the risks are much smaller. Ok, the CNSC and OPG have no credibility, but BELIEVE ME! 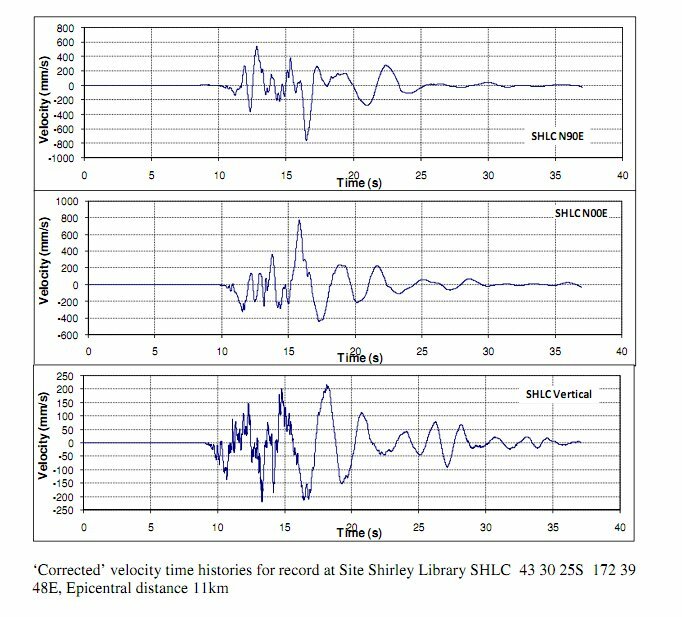 :) Anyway, in the last fading spurt of interest with earthquakes, we had a huge study on the Pickering Fault Urban Myth. It was my glorious ride into the sunset before they kicked me out. So I spent a million bucks on studying the Rouge Valley. Lots of drilling and the rock is as solid as my opinion. :) Really, I have since gone into the whole megathrust thing, and the big fault is under Hamilton. This might not be such a great thing, but it assures that Pickering and Darlington are hit with more normal seismic motions, probably under 20 cm/s. I'll have to go with Tom Adams there, that they need some more humility. It's all the little things that will add up, not the big hardware that has been traditionally seismically qualified. No earthquake in the world can touch that stuff! But that's irrelevant. Somewhere in my writing, I have outlined the scenario for the Great Toronto Earthquake, and it's not pleasant. Now we know the Tremendous Abuse of Geology, from the Niagara Tunnel and the Bruce Thing, but there is no Pickering Fault. Actually, this is the same article as Canada Crumbles, but more details on our courageous lady who tried to penetrate the muck that is officialdom. Like Japan and Toyota, nobody wants to give an answer unless they've checked up five levels. Fate is not kind to those who talk. Fuel starts to get hot and melts the steel fuel holders (fuel bundle sheathing in Canada). This is probably what has happened here and everybody calls it a meltdown for dramatic effect. 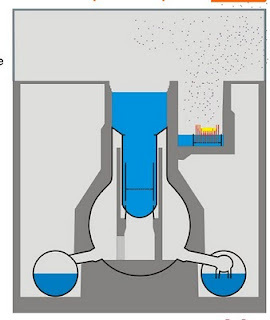 Molten metal puddling in the bottom of the reactor vessel (very thick steel), and the ceramic fuel pellets (4% enriched uranium) also melt. Melted fuel starts globbing together, and starts a sustained reaction, like a nuclear bomb, and burns all the way to China! So, really, the whole thing only works if you have bomb-grade uranium, like the seismic death trap at Chalk River. For a commercial reactor, we just get slag at the bottom of the reactor. There is nothing to explode. Right now, it looks like the seawater is doing the trick even though they are just pouring it on the outside of the steel vessel. They probably can't get inside to the fuel because all the metal inside has melted. Now, the US made all its bomb plutonium from graphite reactors with bomb-grade uranium. Those things can have a meltdown! Very interesting map. I found this while I was looking for the strong ground motions. The only thing interesting to me will be the PGV's under those nuclear plants. Maybe they wouldn't be in trouble if the back-up generators had started up, but those things never work in an emergency, and I really can't see they could be knocked out forever by a little splash. 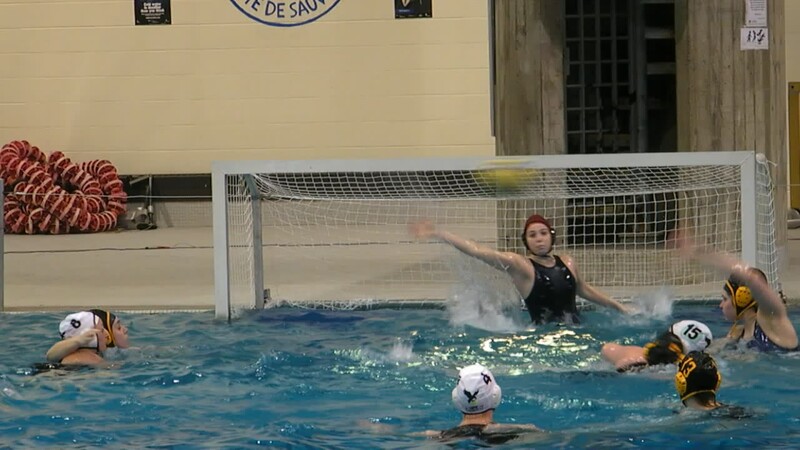 Here is the 30 foot (10 m) zone. That's the height of the tsunami. This is just a map product, and is not the actual overflow zone. 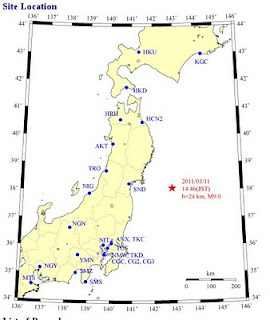 Note that this earthquake hit a 'relatively unpopulated' area, if that can be said of Japan. “But a lot of them were built in the 60s and the 70s and our ability to gather seismic data and do computer modeling on that data is much improved since then,” Sheehan said of the NRC’s reasons for undertaking the survey. Are We Ready for Our One in a Thousand Year Earthquake? Japan wrings its collective hands and says this sort of thing hasn't happened for 1200 years. 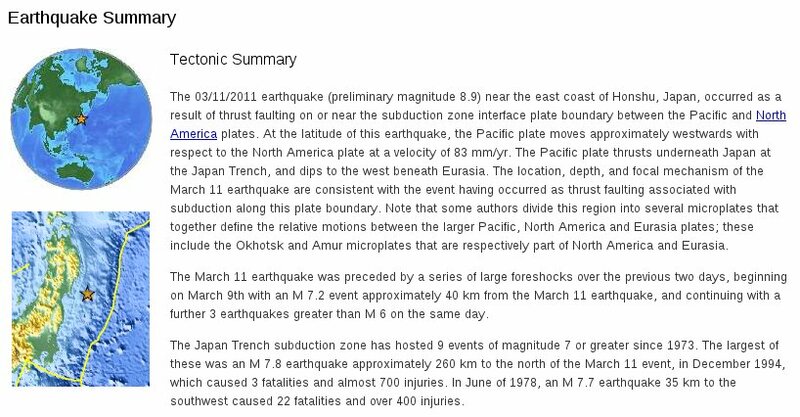 Yet it was happening on a regular basis all around the Pacific Rim, and their plate convergence was very high at 8 cm/y. The amazing thing is that it takes 1200 years to cycle! So, for exactly 3 days, we shall also wring our hands, and ask if it could happen here. By definition, a disaster is a rare event for any one given place. Thus, if we only look locally, like Japan and Christchurch did, we can dismiss the threat. The same for Toronto. We have a big giant fault mechanism bubbling away, but it will only blast us every 500-1000 years or so. We, therefore, do nothing. And all the smug press releases about our nuclear plants. I used to write those things! Sure, when I wrote them, they were essentially true, as long as we kept on top of things. Unfortunately, the 'fat and lazy' burghermeisters of the old company believed them, and read them as 'No Problem - Do Nothing'. So sad. Ontario Power Generation’s nuclear division is overstaffed and overpaid and the utility has “largely failed to deliver” in keeping costs down, the Ontario Energy Board says. “Most consumers would reasonably expect ‘savings’ to mean a reduction over what is currently being paid. This is what the (energy) minister requested and this is what OPG has largely failed to deliver,” the board said in a ruling released Thursday. I'm just thinking of that Polka song. I can't complain about the fat pension, but I consider that I was psychologically damaged, and it's a war wound. Wait until the board sees the actual bill for the Niagara Tunnel! They were so tired from writing the checks, that they poached a manager right from the tunnel contractor to do it. Now that's lazy! Each facility is constructed on a deep foundation with strong concrete floors and walls that are multiple feet thick while frequent upgrades and improvements are made to match standards, said Ted Gruetzner, spokesperson of the Ontario Power Generation, which manages some nuclear sites in the province. Risk assessments are based on worst case scenarios and plants are built with mechanisms to protect Canadians against these incidents, he explained. A plane could not crash into a nuclear plant, he said as an example. I suppose someone had to come up with this statement, what with the near meltdown and such. This is following the classic scenario for a loss of coolant accident (LOCA). The pressure is now above design within containment. They are keeping it there for a reason, and cannot hold it any longer. Lots of iodine isotope coming out, folks. In Canada, with the Candu plant, we have a vacuum building for such a purpose. The steam would be sucked into this massive building, and condensed (turned back into water) by a dousing system. The radioactive water would go out into the lake instead of the atmosphere. Looks like they are waiting for a favourable wind. Soft-Story Condo Towers Will Kill Us All! Studying the effects of the 2009 Megaquake in Chile, Adebar found that many of the buildings that were most affected were newer apartment and office towers reinforced with thinner, six-inch concrete walls for support. B.C. has nearly identical building codes. The thinner walls have become popular in both Chile and North America because they allow for additional parking in underground parkades -- where buildings need to be their strongest. Well, I hope Japan doesn't have too many of these, although the picture of building burning in Tokyo looked like one! This is the only engineer in the world that is on the same wavelength with me on the lessons from Chile (plus the Japanese guys who wrote the report). These buildings are shooting up like weeds all over the place, because YEAH, you got parking! Tokyo might give us a new low PGV showing the true fragility. I suspect somewhere around 20-30 cm/s, well expected for Toronto. I had to do one for Japan! You won't believe it (I didn't) but this part of Japan that ruptured is the North American Plate, down from Alaska. The earthquake ruptured the big red area. They usually stop at the crooked sections, and at significant junctions. 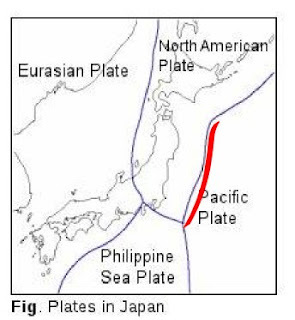 So the lower section of Japan has a totally different subduction zone, and this is what will affect Tokyo eventually. 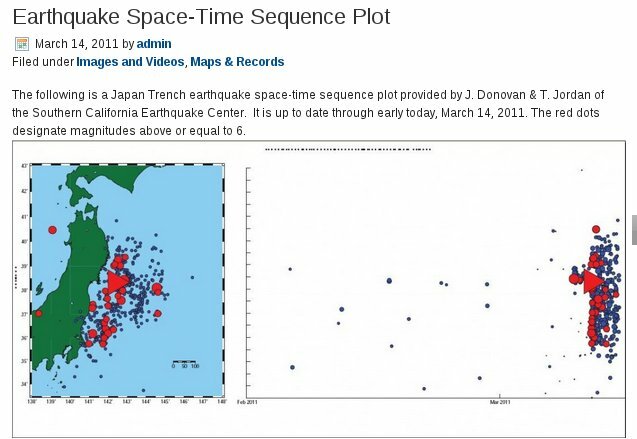 These earthquakes usually happen far out, so the shaking isn't that bad, and also they tend to rupture somewhat slower. But when they go, they flap a big piece of crust, and that's what shlooshes out, sort of like holding water in a pizza pan. Japan has declared a “nuclear emergency” at an atomic plant north of Tokyo after cooling systems failed following the country’s 8.9 magnitude earthquake. Naoto Kan, prime minister, stressed that no radiation had leaked from the Fukushima Daiichi facility’s six reactors. But residents living within 3km of the plant were being evacuated by the military, and those within 10km told to stay in their homes. Well, this is one story I'll try to follow. We never did, and never will, get any useful earthquake information from Japan nuclear plants. They always claim they erased the tapes, or some such excuse. They use those boiling water reactors which have their insides shattered in an earthquake, and their seismic housekeeping seems feeble. I am certain that they had 40 cm/s or less at the nuclear plant. If I were King of the Nukes, I would make sure that a nuclear plant could ride through this operating. There is no excuse to be as fragile as a cheap condo tower! Our own nuclear plants would just barf at this PGV, not the major components, but all the little things adding up. They never look at the little things, either here or in Japan. We'll eventually find out something from this nuclear plant, but not enough to help anybody. Here is the automatic Shakemap for this earthquake. Note that we get a first glance at the rupture area, which seems to me a little short for an 8.9. I'm sure it's at least 1000 km and zooms off to the north more. 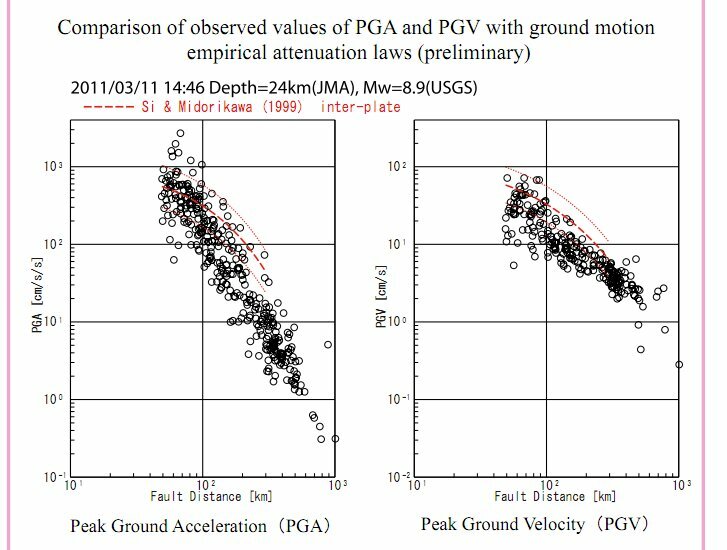 As we can see, a classic subduction earthquake does not pump out a high PGV. From the videos, the shaking appeared mild, and would have just hit the swamps. This is farther out than Chile, so maybe it's just 40 cm/s on average ground. I don't think they build soft-story condos there! This is so big, and my eyes still aren't working. 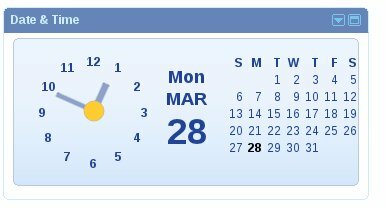 I took this from the USGS site, and it is sufficient. Two quakes together, right at the tip of the advancing shear wing. Maybe they don't know the pumping has stopped. Although the sudden stopping of earthquakes was the most dramatic thing I've ever seen, there is a chance the whole thing has been opened up (fracked) so that natural forces can take over. Or maybe they've been sneaking in at night! I know that I will be stunned, if the extent of their pumping is ever 'leaked' to Ontario Leaks, since they must have exceeded every previous earthquake-creating effort. If there is a natural feed, I would expect a sudden drop with the stoppage of pumping, and a slow buildup. QuebecLeaks has launched without anything. Therefore, to be fair, I have launched Ontario Leaks. Note that my site is two words! Quebec Learns the "Lesson of Arkansas"
And there were reports from the U.S. of strange phenomena surrounding shale gas -- like frequent earthquakes. Last week, in Arkansas, natural gas companies were ordered to temporarily stop injecting into wells after state authorities concluded the practice was linked to hundreds of earthquakes in the area in the past six months. Now, why couldn't they add the line "...and then the earthquakes totally stopped." Why can't anybody? The United States Geological Survey is burying 3,000 seismographs near the San Andreas fault in the Coachella and Imperial valleys for its Salton Seismic Imaging Project. They're being distributed among seven stretches of land and will measure seismic waves from small explosions simulating 1.5- to 2-magnitude earthquakes. After Arkansas, it becomes apparent that all attention is on California. I mean, who wants to be stationed in Arkansas? They've done a lot of horribly expensive things in California, and it doesn't come up with much. Earthquakes are chaotic and can happen anywhere, any time. Still, not a speck of news on the 'Miracle of Arkansas'. "I think the safety case is far stronger here . . . at well over 2,000 feet, you could stick the CN Tower in it and have a couple hundred metres of fill on top, that's how deep it is," said Kraemer. "All of what we saw (in Europe) was the best in the world. What we have here will be the best ever built . . . the geology is as close to perfect as we can get." Once submitted, the "extensive" 10,000-page document, and 60-page summary will be made available to the public for a sixth-month review period. "Anything you ever wanted to know about the project is there," said NWMO's Marie Wilson, whose federal organization is providing technical services and regulatory support for DGR owner, operator and licensee, OPG. "The profile will be heightened during this time, both regionally and nationally." When I was in the business, you never submitted anything unless it could break your toe if you dropped it. The slipperiest tax avoider I know once told me that you have no flexibility until your tax return is over an inch thick. But these documents are daunting. I'm sure as hell not going through them! Perhaps one of you younger heroes out there will volunteer? You could set up a Wikileaks-like team, and present it in digestible chunks. Anyway the interesting things aren't what they put in (like how many ducks they won't bother), but what they leave out. For the game is to bury all your opponents in massive deluge of your good points. The hearing is a sure thing, they never do anything there. This is the Niagara Tunnel all over again, but with some radioactivity. Should be fun (oops, blood-lust again!). Dang! My blood-lust is thwarted! They stop the injection and Arkansas is wiped off the earthquake list on the side of the blog. Apparently they never had any legal control over the rate (amazing! ), so we may never get a time-history of pressure and volume rate. I'll bet that would have shown something interesting! The one interesting thing is that injection is essential for this dirty business. They must start up again, or move to somewhere else in the state. They should change the laws to get some more scientific information. We had a similar thing in Ontario (Gobles Oil Field), but it never got up to more than M3. Ah well, everything I write about is shutting down. Time for a nap. The nine-member commission will consider its staff’s request to stop use of the two wells through the end of March. The commission would reconsider the ban at its regular March meeting. “We understand the concerns of citizens who reside in northern Faulkner County and respect the commission staff’s desire to address perceived issues associated with the seismic activity. However, we remain very confident that an objective review of the facts and science do not support the proposed action,” Danny Games Sr., director of corporate development, said in a release. “We have dedicated extensive resources and have consulted with several very qualified geophysicists and seismologists to better understand the science, including the natural seismicity of the area that long pre-dates our operations,” he said. Wow, they may be moving against a $4 billion operation! Somehow I doubt it. I give it 50-50 that the earthquakes will stop, if this action happens. However, there is the chance that it has grown enough to tap into the natural groundwater, and/or it intersects another disposal operation. My husband and I live in Toronto by the lake. We are very worried about all the earthquakes going on... we even had a minor earthquake last summer as you know. 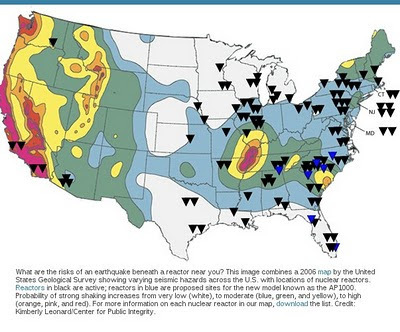 We also have been reading a lot about the New Madrid Fault Line. is it for real? We have been reading that it will rip open and that it will cause some sort of near apocaluptic floods, Tsunamis and so forth... What is your scientific and oersonal view on all this? And if it were to be true, where would you advise to move? Is there any area in Ontario that is absilutely earthquake free and also at a very high elevation to avoid any potential floods? Im sorry if this is a silly question but these days we are not sure yet whether to believe the media, or simply if its getter to do the research on our own. I hope you can help us. Dear Wendy, your thoughts are exactly the same as many people I've talked to over the years. That is why I'm putting your lovely note up, to help others. I'm also amazed that a long note comes from an iPad! Maybe I should get one! Anyway, I find there are two attitudes for earthquakes. One is total willful disregard, like Toronto and Christchurch. The other is terror. Neither of them is healthy! Although the Hamilton Fault is stirring up a big earthquake for us, I don't think it's much different anywhere else. Also, I find that places with no chance of earthquakes are extremely dull. Must be the lack of Radon in the air! Nobody in the 'power world' acknowledges the tremendous amplifications of soft soils. They always say a factor of 2, whereas we know it's a factor of 10 to 100. Thus, a famous seismologist in California lives on a house on solid rock, where they had to blast the foundations. I would live in such as house as well, if I never had to go on the freeways! Nothing will happen to that house! Same in Toronto and Burlington. They've done some really stupid things. One housing development is in the major sag pond. In High Park and the Beaches, they never fix their brickwork. Lots of soft story highrises on the hanging wall. This is a result of happy willful ignorance. Now, what will really happen? In Christchurch, 300 people dead in a city of 300,000. That's 0.1%. Maybe that's the same for Toronto's M6.3. Most likely 10% of building stock damaged. I don't think this is something to panic about, but a little effort could make it a lot better. So, there is nothing very major happening, no volcanoes, no tsunamis. New Madrid will stay down where it is, and be eventually joined by its vigorously growing baby brother in Arkansas. They will never bother us, except for people in highrises, who will barf into their emptied fish tanks. What can we do? If you strongly felt the M5 in June, in Toronto, at your house, you are doomed! :) Fix your brick, secure everything inside, get earthquake insurance, and hope you are elsewhere when the earthquake strikes. But really, as long as your collection of anvils doesn't fall on you, you will most likely live. For those really worried, get thee hence to rock, or equivalent, very hard till. Nothing is going to happen on that stuff. I was out on the patio, and didn't feel the earthquake, and it was barely felt inside. My place is safe, but I did secure the huge leaning mirror on the upper floor. As for any other disasters happening, there is always the chance no matter where you live. Ice storms, tornadoes, etc. My cottage is on a tornado alley, one just missed us. There is no basement, or any possible escape, yet I love it. You can't escape everything, even hiding in a hole has its dangers. 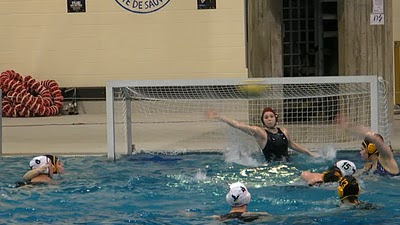 For those who have liked my water polo videos, I have some more. According to a list published on the commission's website, there are currently 412 companies connected to the oil and gas industry in the state. But there are three companies digging for gas using seven active disposal wells in the moratorium area -- three commercial and four non-commercial, Shane Khoury, deputy director and general counsel for the commission, told FoxNews.com. Southwestern Energy, which announced production in 2008 of more than 500 million cubic feet of natural gas per day from the state's Fayetteville Shale, and Chesapeake Energy, operate the non-commercial wells. Calls and e-mails to both companies were not immediately returned. I've been waiting for these. For anywhere else in the world, we should not expect much damage for an M6.3. However, the general statement is that the buildings were fine, but were exposed to 2g acceleration, which is almost a world record, and allows one to throw up hands. As we look at the records, we see that nearly all of them have permanent displacements. This throws out the use of response spectrum methods. Engineers should not quote those spectral accelerations. This is the most reasonable record, with minimal permanent displacement in the N-S direction (middle). I'm going with 80 cm/s with the cleanest velocity pulse yet. I'm using this one for analysis. The displacement is a very minimal cycle, and demolishes all assumptions about response spectra and sinusoids. Nevertheless, the engineers will stick with tradition. This can also be used as an input for explicit analysis. 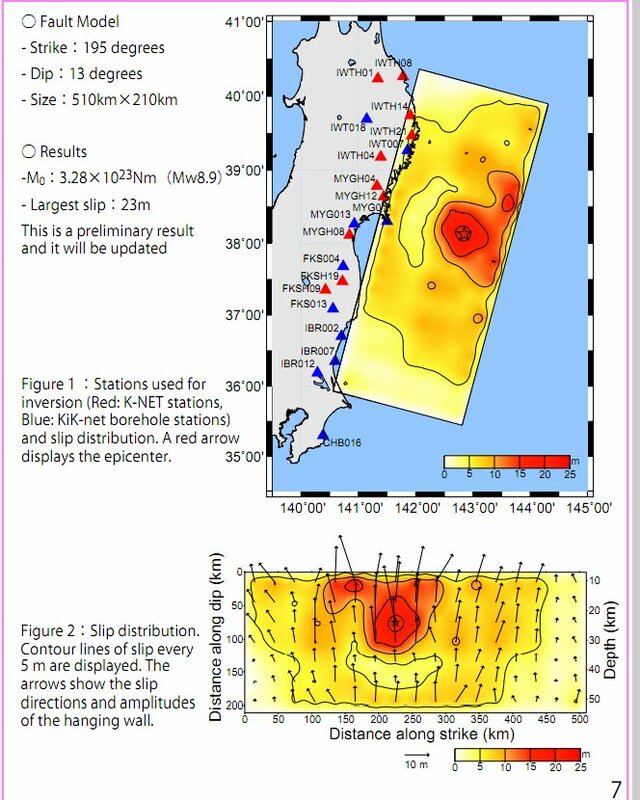 20 cm of displacement is more like the centre of the Chile earthquake (M8.8). In fact, as I think about it, these records are almost exact duplicates of the max. Chile records. 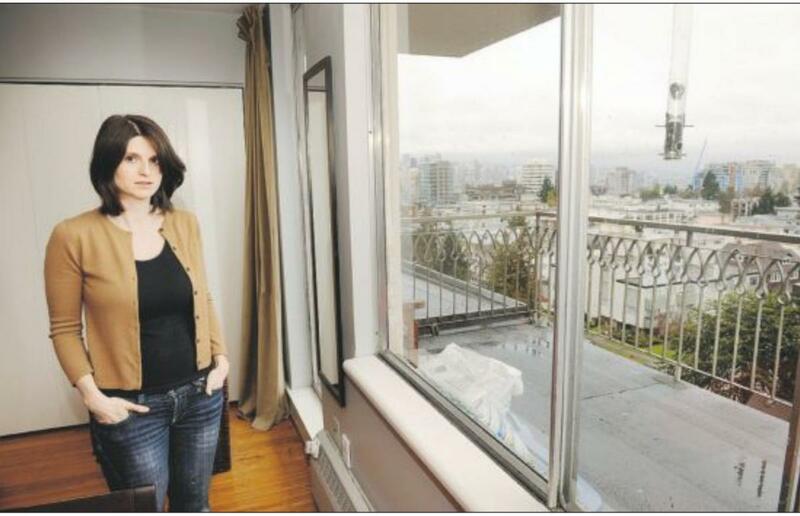 Remember that at the Chile epicentre, all modern soft-story buildings (cheap condos) collapsed, and were slated for the dump, farther out in Santiago at 40 cm/s. The integrated records showed 3m of permanent displacement at the epicentre. I still believe that the 80 cm/s for Christchurch was amplified by a factor of 10. Really, we only expect 10-20 cm/s for an M6.3, and these small things rarely go super-shear.